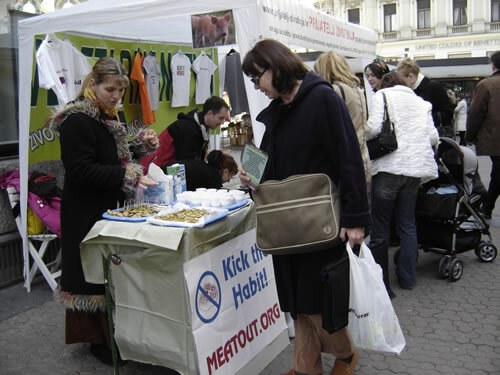 This month, ethically aware individuals as well as organizations and institutions in more than 25 countries and 60 cities from all over the world will welcome Spring by asking their friends and neighbors to "kick the meat habit" on the first day of Spring and explore wholesome, nonviolent plant-based diet advantages. The global Meatout observances are being held over 20 years all around the world. Many mayors will show their support to Meatout proclamations promoting non-violent consumption of fruits and vegetables to million of people as well as celebrities like Joaquin Phoenix, James Cromwell, Jennie Garth, and Alicia Silverstone. Meatout draws massive support from consumer, environmental, and animal protection advocates, as well as from public officials, health care providers, educators, and the mass media. 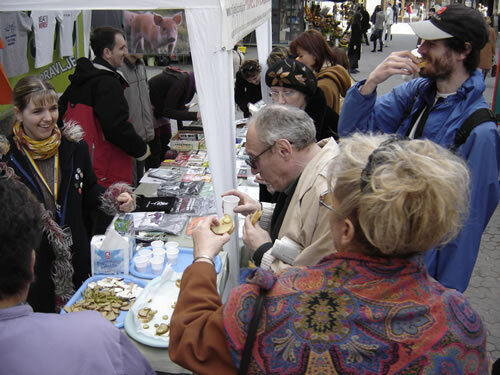 They believe that consumers are entitled to a respite from and a response to the relentless barrage of meat industry propaganda in schools, in the media, and in the streets and to raise their voice for better and healthier life of all people by not harming animals or the environment. Though Meatout is an observance that lasts for only one day, some federal states legislatures have recommended vegetarian options for school children, whilst mainstream health advocacy organizations are encouraging increased consumption of vegetables and fruits. On the other hand, more and more food manufacturers are marketing meat and dairy replacement products, and supermarkets are carrying a growing variety of these products. A balanced vegetarian diet is healthy, has a nutritional value and helps in preventing of certain diseases - the main killers of our modern world: heart disease, stroke, various cancers, diabetes, etc. 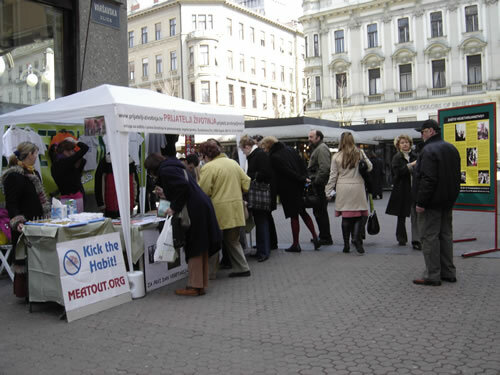 Meatout Croatia 2006 will be marked in Dubrovnik, Split, Rijeka, Pula, Umag, Karlovac, Sisak, Krizevci, Varazdin, and Osijek with information tables and vegan tastings, whilst in Zagreb, on the info stand of our organization apart from handing out educational materials and vegan tasting a "prize contest" will be organized in which visitors of the stand receive books, T-shirts, postcards and pins about vegetarianism, as well as vegan products like soy milk, cheese, etc. The information stand will be placed on Monday, March 20, at the corner of Varsavka ulica and Trg Petra Preradovica, whilst the first winners will be drawn at noon. 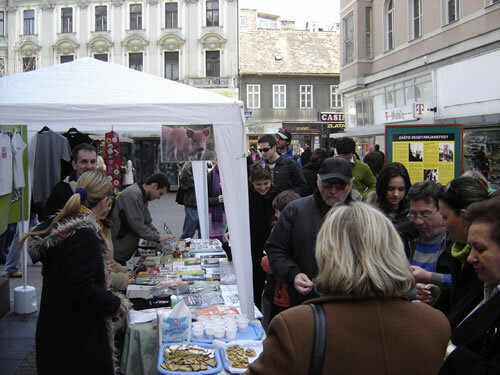 Since each person that switches to a plant-based nutrition saves about 2,000 animal in ones lifetime, Animal Friends invites all Croatian citizens to not hesitate and switch to a non-violent diet while making it with this year's first day of Spring their new life-style, for the animals, for our planet, and for ourselves!